Renal failure is a common clinical situation in which imaging modalities, and especially grayscale ultrasound (US) with color/power Doppler US and Doppler interrogation of renal vessels, may be essential for the diagnosis and characterization of the type of acute renal failure (ARF), especially to differentiate the renal from the postrenal forms. In the postrenal forms of acute renal failure, grayscale US is accurate in detecting hydronephrosis, even though it may reveal false-negative results, such as obstructive ARF with nondilated urinary tract, or false-positive results such as dilation of the urinary tract in nonobstructed patients. 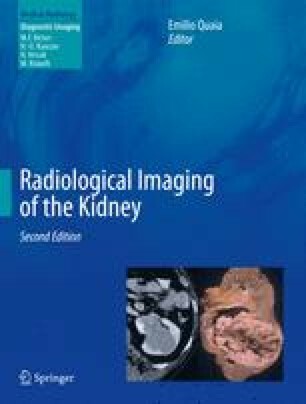 In chronic renal failure, both kidneys present typical imaging features, which can be identified by US and color Doppler US.